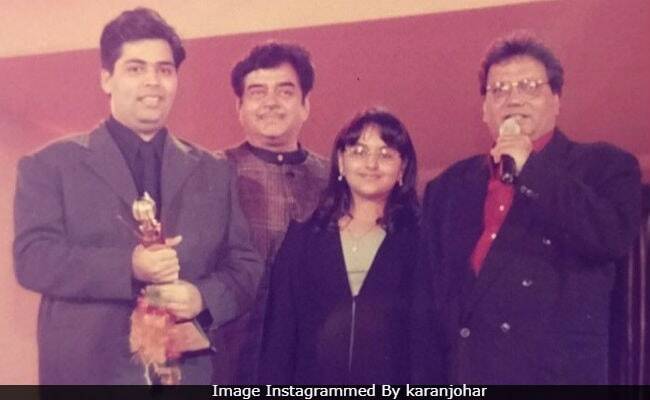 Karan Johar shared an epic throwback on Saturday evening, which appears to be taken about two decades ago, when Sonakshi Sinha had given the Zee Cine Awards for best director to the filmmaker for his debut film Kuch Kuch Hota Hai. With the picture, Karan Johar poked fun at his appearance and wrote, "I have won an award but look like I ate the ceremony," adding the hashtag 'double chin alert.' "I have to thank Abhishek Bachchan for sharing this with me! Remember this Sonakshi?" Karan captioned the post, which also features Sonakshi's dad and actor-turned-politician Shatrughan Sinha and filmmaker Subhash Ghai. "How can I forget? The first award I gave ever. This is gold," Sonakshi commented. Abhishek, who is the source of the picture, just couldn't stop laughing and wrote, "Ha ha ha." We also bring to you a short video from the award function, held in 1999 and hosted by Aishwarya Rai Bachchan and Akshaye Khanna. Kuch Kuch Hota Hai, as mentioned earlier, was Karan Johar's debut film as a director. It was a blockbuster and starred Shah Rukh Khan and Kajol in the lead roles. Rani Mukerji debuted as an actress with Kuch Kuch Hota Hai. Salman Khan played a pivotal role. Karan Johar and Sonakshi Sinha shared screen space in Welcome to New York, which released this year. Sonakshi is currently touring the US for Salman Khan's Dabanng Reloaded Tour, along with Katrina Kaif, Jacqueline Fernandez, Daisy Shah and others. Her next film is Kalank, produced by Karan Johar.